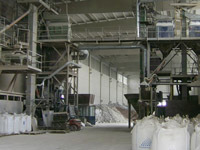 Recovering of industrial waste and production of secondary raw materials. Waste materials management constitutes activity of public interest, and it's regulated by lawmaker to defend human's health and the protection of the environment. The need to recover raw materials from the waste ones, which can be reintroduced in the industrial cycle for the production of new artefacts through proper handlings, has increasingly imposed itself over the years. Pirani S.r.l. has made this concept its own for over 40 years, steadily developing its own ability in the recovering of some kinds of waste products. Produced secondary raw materials are mainly assigned to refractory, ceramics and brick industries. David snc places its own experience and professional competence at Pirani Srl clients' disposal, in order to create new added value from these secondary raw materials. 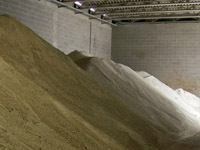 A close collaboration between the reclaimer and the industry which re-uses these materials makes the reintegration of the products extracted from these "mines" more competitive and effective. I rRefractory scrap are manually separated according to their types, then incidental impurities are removed, and these scrap are finally ground and milled. We obtain ceramics mixtures from slurry, filter pressed materials and powders through suitable handlings like separation, homogenization and mix. Production of granulated materials for building industry from the recovering of floor and wall tiles, from bricks and other ceramics: gres, klinker, vitreous china etc.